While I’m busy with preparations for co-guiding a one-week trip to Sarek National Park and the Vatnajökull 2012 project I noticed that I have punch of surplus kit that I’d like to sell. I’m not sure about using the blog as a marketing channel… But what the Hell, I need money. Here is a short list, if you are interested drop a comment or send me an e-mail. I will be away from the computer starting on very early March 6th and during that time the first to offer the asked price gets the product. I’ll be back to confirm things and ship them around March 15th. But I’m still able to send stuff untill Monday March 5th. Me in Svalbard wearing the very warm Nahanny Down Trousers now for sale! Postage will be added to the price. For international customers Paypal would the preferred method of payment. Discounts possible if you buy a bigger set. Sasta Storm GTX Proshell trousers, size 54 (L/XL), black, new & unused, 300 eur – SOLD! – Predecessor of The Pole Pants, only minor differences. Superb for demanding winter conditions. New & unused. – Very, very warm custom-made down trousers for serious cold or big mountains. Waterproof breathable fabrics inside and outside. 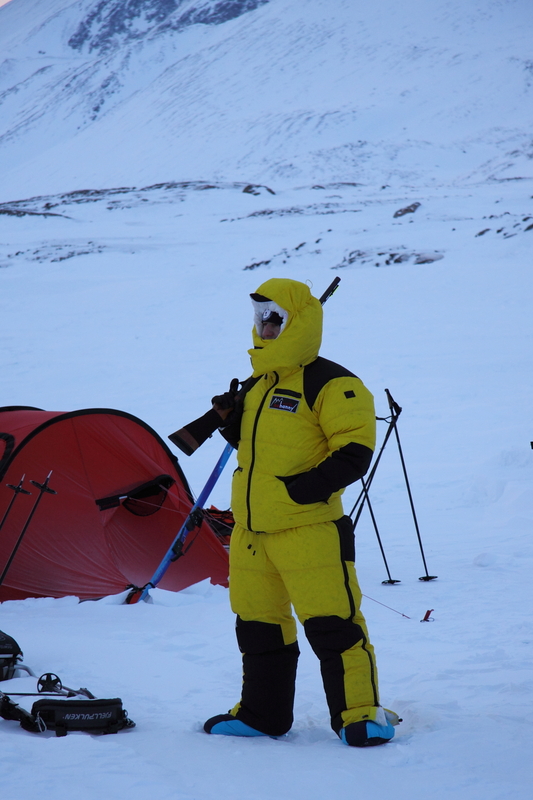 They’ve spent four weeks in a stuff sack in pulka and used once in polar bear guard in Svalbard i.e. as good as new. Comes with stuff sack. More info from Nahanny website. – These boots. Used for about 15 days and 150km so in great condition. BPL Absaroka backpack, 44L, size L, used but great condition, 90 eur – SOLD! – The very light pack for heavy loads. More info from here. Used but in really good condition. – Simple and light waterproof breathable shell with Halti’s own Drymax Motion 2.5 membrain. Jacket with nice hood, two pockets, water-repellent zippers, velcro tabs on sleeves and draw-cord hem. Over trousers with fly zipper, 1/4 zips with protective flaps, suspenders, little inner mesh pocket. Simple and relatively light, a bit baggy cut. Used for few summers but in working condition. Outdoor Designs Classic Mountain Shelter 2, green, used but great condition, 30 eur – SOLD! – A windsack for two people. Probably the predecessor of the Group Shelter. Light and simple shelter for two for breaks or emergencies. Used few times on lunch breaks on tundra but as good as new. Outdoor Designs Summit Mitt, size L, used but great condition, 30eur – SOLD! – These sturdy shell mitts. Used few times odd times when building snow shelters but nearly as good as new. – A relatively light and simple canister stove. Used for two summers but working and okay condition. PS. For Finnish customers there is a bit more thorough list in Finnish at Relaa.com! Thanks for all the buyers! I can now afford a plane ticket to Iceland but I’d still need a transportation to the glacier and some food to keep me going. So please, be kind and buy the rest of the kit. I’m now leaving to Sarek National Park for a week of skiing and guiding so I won’t be reading my e-mails for a week.